Throughout September an occasional splash of orange interrupts the green, yellow, and brown colors that dominate our fall landscape. Such a welcome colorful highlight is provided by perennial plants called globemallows. Of the 14 different species of globemallows native to New Mexico, at least two are found in Deer Canyon. Globemallow species are not easily distinguished because both the leaf shape and flower color can be quite variable, not to mention the various species are known to hybridize. I believe the species we see with upright floral spikes pictured above is the gray, or soft globemallow, Sphaeralcea incana. 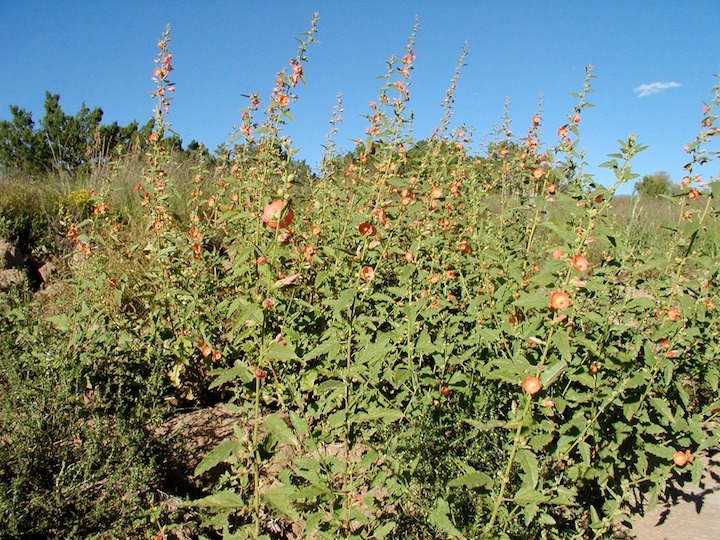 The name Sphaeralcea comes from the Greek words sphaira (sphere) and alkea (mallow). Incana is Latin for gray, so in this case the common name derives directly from the scientific name. Globemallows belong to the mallow family (Malvaceae) along with hollyhocks and hibiscus plants. The mallow family is characterized by cup-shaped flowers with five petals. In the center of each flower the female structure (carpel) is surrounded by a ring of many male pollen-producing structures (stamens). The stalks of all the stamens are fused together forming a tube surrounding the carpel. The fuzzy-appearing yellow ball in the center of each flower (visible in the left photo below) results from the many ends of each stamen as they individually bend away from the central tube prior to releasing their pollen. The right photo is the other species common in Deer Canyon the scarlet globemallow, Sphaeralcea coccinea (coccinea means scarlet). It grows much lower to the ground and has leaves that are deeply divided (with thin, branching lobes). Globemallows have a long flowering period, some species bloom from March to October; the fruits are edible and were probably eaten by Native Americans. The leaves and stems of globemallows are slimy when crushed and this characteristic has led to a variety of uses. The sticky pulp produced by pounding the plants has been added to mud to make a particularly hard flooring material, when mixed with water it produces a plaster used to cast broken bones, or added to paint preparations to make them adhere more tightly. Traditional medicinal uses include producing a poultice on sores and boils, root preparations applied to stop bleeding, and chewing leaves or flowers for a sore throat. Most people know that annuals are plants that grow from seed, flower, set seed, and die in one growing season. Perennials also grow from seed, flower, set seed (in some cases not in the first growing season), but then they overwinter so that the same individual plant can grow again the next season and repeat the cycle for many additional years. It seems that perennials have a significant advantage over annuals; if so, why aren’t all plants perennials? Whatever happened to survival of the fittest? Did annuals somehow miss the evolutionary express and become doomed to ride the local jitney? Let’s not get carried away, after all last month’s annual, the golden crownbeard, seems to be surviving quite nicely, thank you very much. Perhaps the best way to think about this is to recognize that all species existing today are successes in their own right. However over time different species have adopted different survival strategies. All species must make due with limited resources, the question is how best to allocate the resources they are able to garner. The strategy of annuals is to be fast growing and reproductively promiscuous. Annual plants direct almost all the energy they acquire to producing as many seeds as possible and dispersing those seeds efficiently. Perennials do not have the luxury of using all their energy for reproduction. They must build energy reserves, usually in some type of underground storage organ, in anticipation of next years growing season. They also spend a larger portion of their energy budget on long-term survival issues like preventing herbivores and pathogens (structural defenses such as thorns, and/or a vast array of chemical defenses). They cannot afford to use as high a portion of their energy for reproduction, but if one year’s crop of seeds is minimal or even missing completely, it’s not a total loss – there’s always next year. And in general perennials are much better at propagating themselves vegetatively; sexual reproduction (seed production) is not their only option. So is one strategy better than another? It’s a toss-up, clearly both strategies work very well. A little like the tortoise and the hare. The tortoise may win the race, but around here our jackrabbits constantly remind us that the hare is quite successful in the game of survival as well. Want this essay as a pdf, complete with photos? Download it here!